I wish I were a better photographer, because these pictures simply don’t do this meal justice. They say a picture is worth a thousand words. If that is the case, these are only worth about 500, so I will try to make up for it with words. The flavors, the texture, everything about this meal was heavenly. 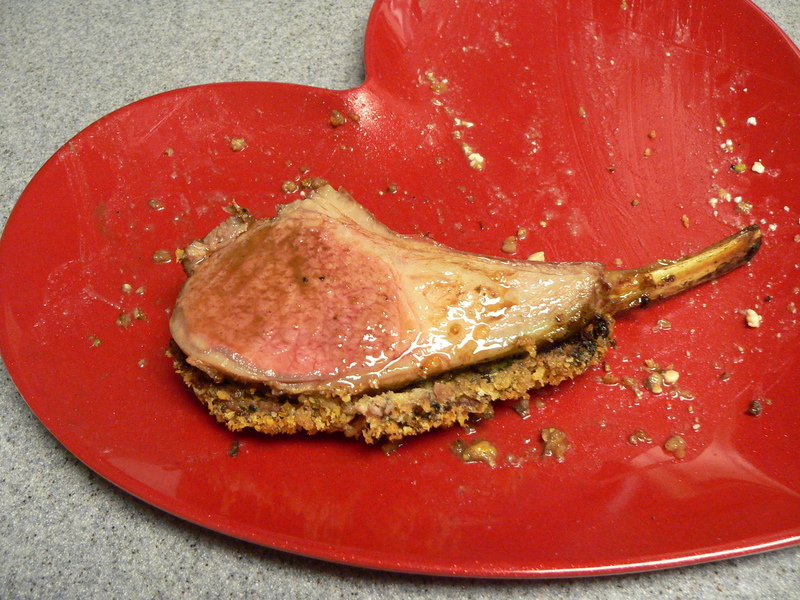 The Rack of Lamb was so tender it literally melted in my mouth. I am certainly not a lamb connoisseur, but if this is what all lamb tastes like, count me in. It was like the best prime rib you’ve ever tasted multiplied by one thousand. Some call it gamey, which carries a negative connotation with it, but I gotta say, I am a fan. The lamb combined with the spicy lamb sausage crusted on the outside and the no-too-sweet grape sauce on top, made for a mouth watering experience. It just doesn’t get any better than that. 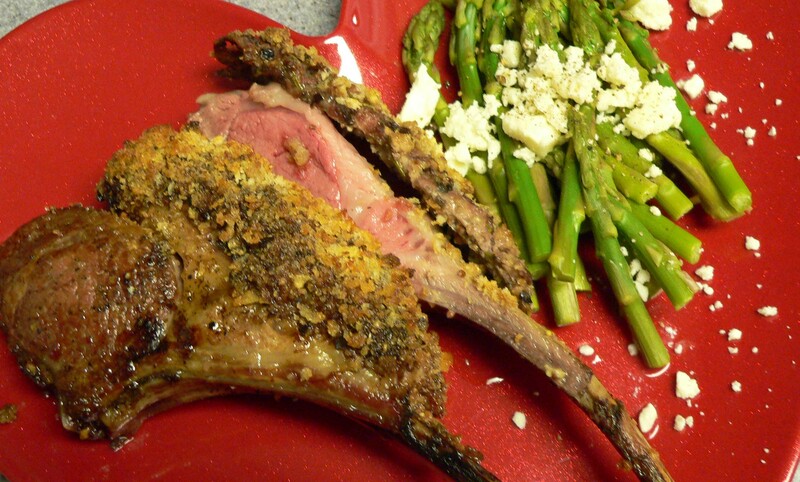 We served it with fresh asparagus, drizzled with fresh lemon juice and sprinkled with feta cheese. The citrus of the lemon, paired with the creamy bite of the feta and the crunch of the asparagus was just right. 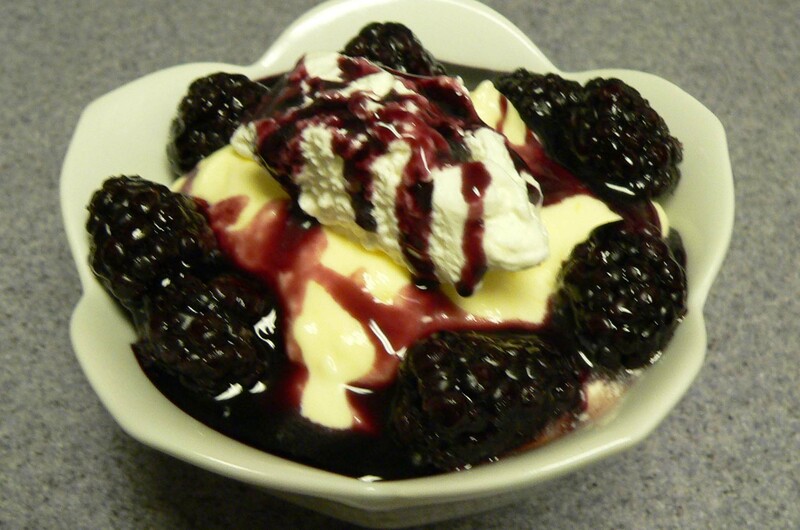 We topped it off with dessert- Lemon Mousse with Fresh Berries and a homemade wine reduction sauce. If there were a rating higher than “ah-mazing,” this meal would get it. 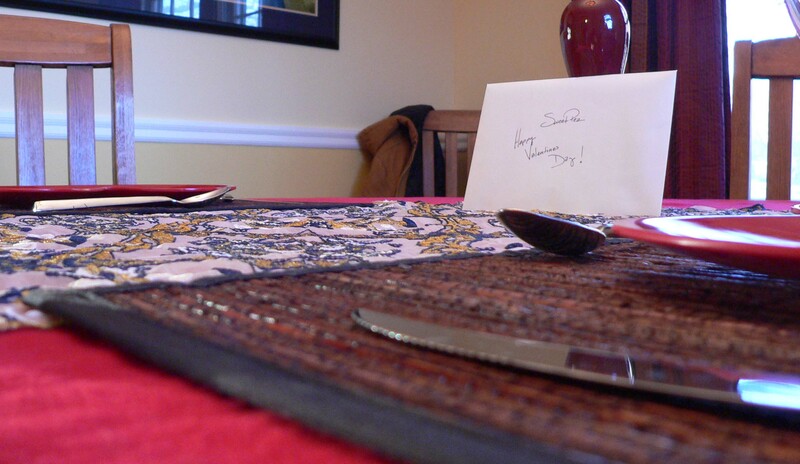 What a wonderful Valentine’s Day Dinner. Preparing the Fresh Grape Pan Sauce. The rack of lamb, covered with the lamb sausage. The table, set and ready for our feast. My Valentine’s Day card from my sweetie. 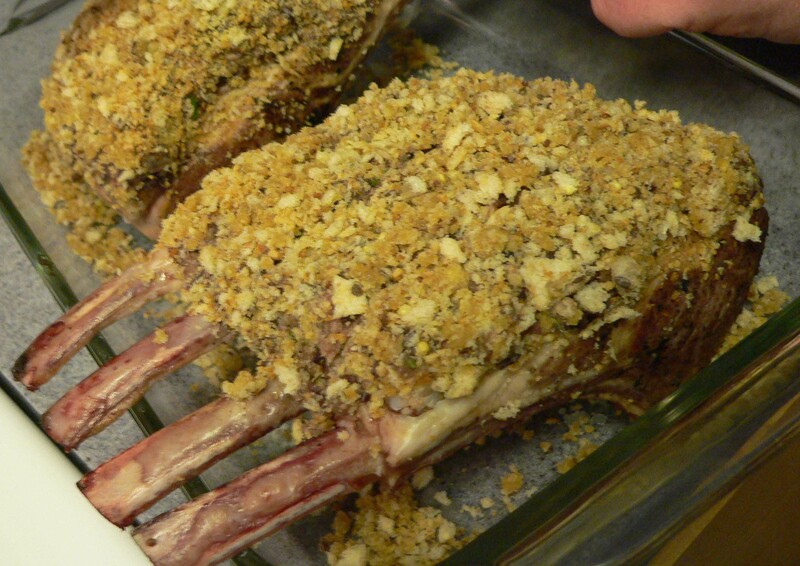 The rack of lamb, covered with the lamb sausage, now with bread crumbs, preparing to head into the oven. Out of the oven and ready for slicing. After we cleaned our plates, we went back for more. Look at that meat! 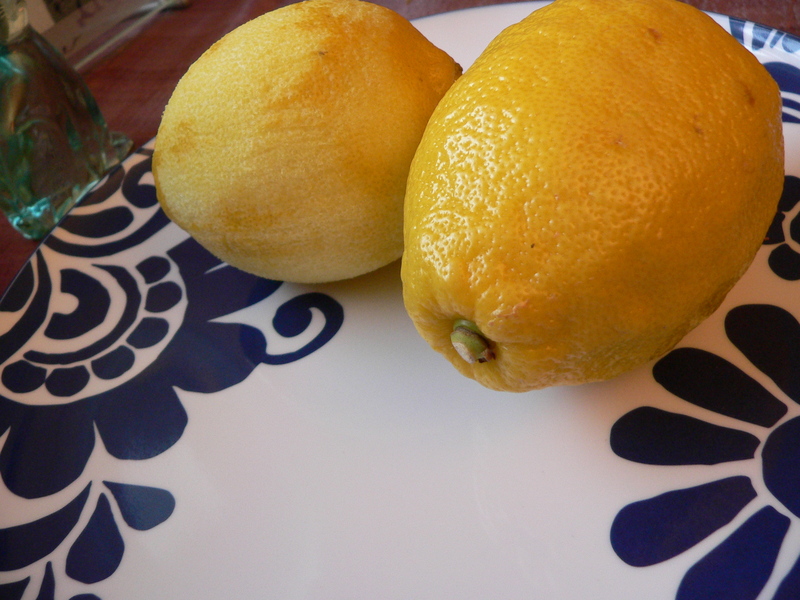 Lemons used for the dessert, one with rind grated off. Boil all ingredients in large saucepan until reduced to 2 1/3 cups, about 20 minutes. Cool. Puree in blender. DO AHEAD: Can be made 5 days ahead. Cover and refrigerate. 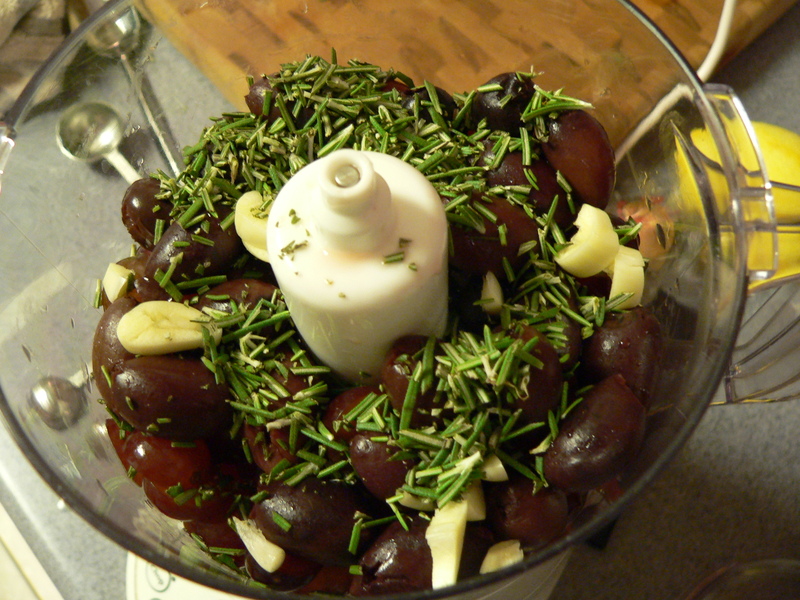 Pulse grapes, olives, chopped rosemary, vinegar, and garlic clove in mini processor until olives are chopped. Transfer to bowl. Mix in ground lamb,1/2 teaspoon salt, and 1/4 teaspoon pepper. 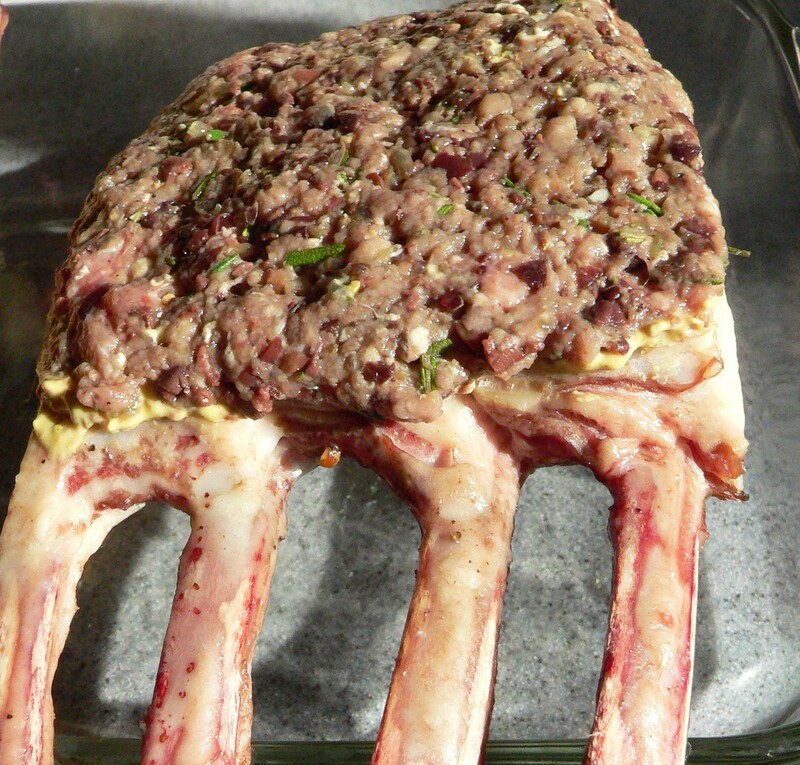 Sprinkle racks of lamb with salt and pepper. Heat 1 tablespoon oil in large skillet over medium-high heat. Add 1 rack, meat side down, and cook until browned, about 5 minutes. Set on rimmed baking sheet, meat side up. Repeat with 1 tablespoon oil and remaining rack; reserve skillet. Cool lamb completely. Add 1/2 cup broth to skillet. Boil until reduced to glaze, scraping up browned bits. Add to sauce. Cover and chill. Spread each rack with 1 tablespoon mustard. Press half of lamb sausage over top of each rack (layer will be thin). DO AHEAD: Can be made 1 day ahead. Cover and chill. Preheat oven to 425°F. Combine breadcrumbs, 2 tablespoons oil, and 2 tablespoons mustard in medium skillet. Toss over medium heat until beginning to color, about 5 minutes. Press crumbs over sausage on each rack. 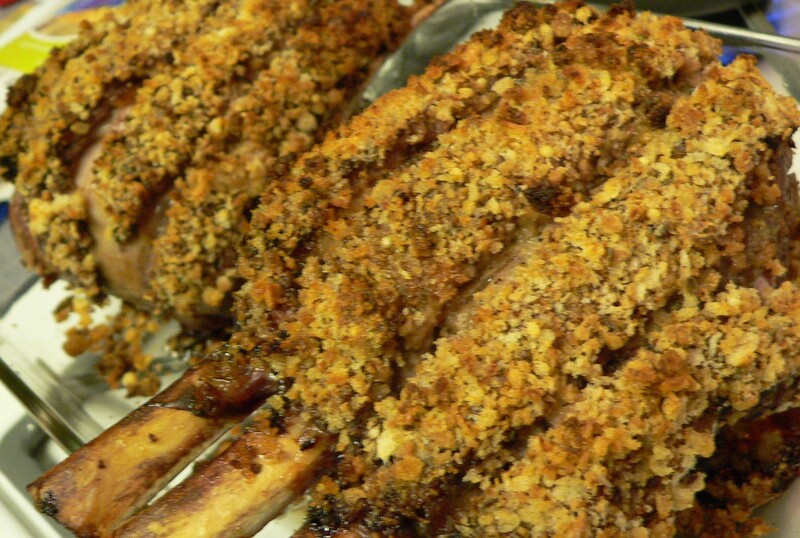 Cut through crumb crust (not lamb) between bones to score. Roast until thermometer inserted into center registers 135°F, about 30 minutes for medium-rare. Transfer lamb to platter; let rest 10 minutes. Pour juices from baking sheet into sauce. Simmer in small saucepan until reduced to about 1 1/3 cups, about 9 minutes (sauce will thicken slightly). Season with salt and pepper. Cut lamb between bones into chops. Set two on each plate. Spoon sauce over. 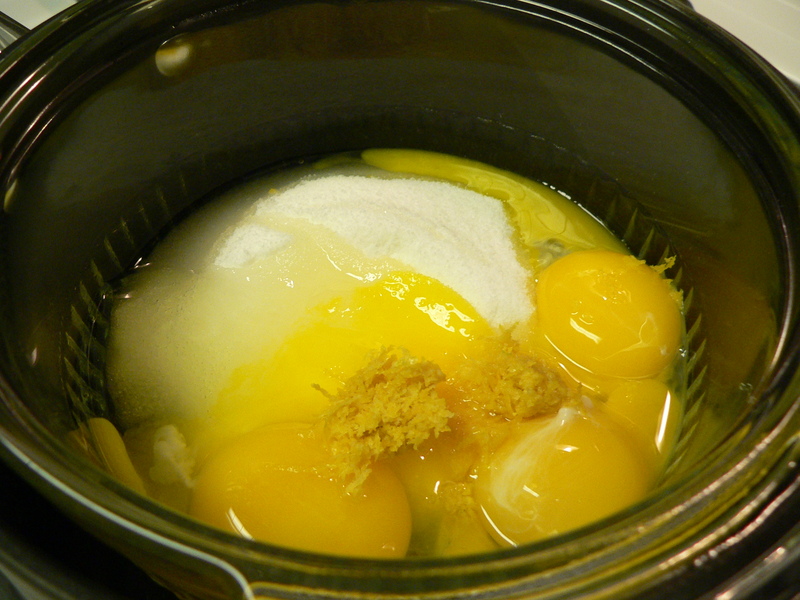 Combine 1 cup sugar, lemon juice, 6 egg yolks, 2 whole eggs and grated lemon peel in large metal bowl. Set bowl over saucepan of simmering water (do not allow bowl to touch water). Whisk until mixture thickens and thermometer inserted into mixture registers 160°F. Transfer lemon curd to another large bowl. Chill until cool, whisking occasionally. Using electric mixer, beat 11/2 cups cream in medium bowl until medium-firm peaks form. Fold 1/3 of whipped cream into lemon curd to lighten, then fold in remaining whipped cream. Using electric mixer, beat remaining 1/2 cup cream in medium bowl until stiff peaks form. Spoon whipped cream atop desserts or transfer whipped cream to pastry bag fitted with large star tip and pipe atop desserts.